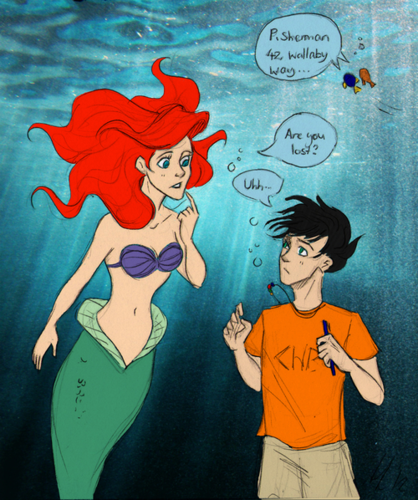 Percy meets Ariel. . Wallpaper and background images in the Percy Jackson & The Olympians boeken club tagged: percy jackson percy ariel nemo. 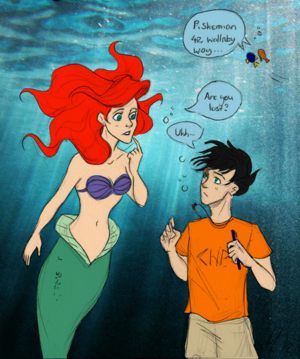 Seriously ariel get a life- and know who percy is! u just spoke my mind and are the not they like brother and sister i mean like seriously. Percy's dad is Pisidon and so is Ariel's so like Percy u got a sis altho,he has like 1 million. Also get the f out of the picture dory and Nemo ITS NOT UR SHOT. Get a life Nemo.